The scene’s now set for the start of the fourth edition of the Perini Navi Cup, taking place in Sardinia’s Porto Cervo from 1st to 4th September. 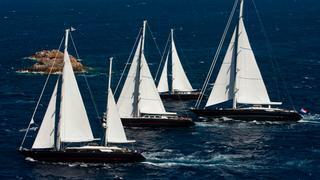 18 Perini Navi sailing yachts have gathered in Porto Cervo for the event which is open only to yachts built by the renowned Viareggio shipyard. Organized by the Yacht Club Costa Smeralda, the regatta combines spectacular sailing with an exclusive rendezvous for the owners who make up the ‘Perini family’. Fleet racing will take place over three days with courses of up to 40 miles set against the crystalline waters and granite islands and outcrops of the La Maddalena archipelago. The fleet of superyachts will include the newly launched 56m ketch Fidelis, designed in collaboration with Ron Holland. Fidelis is the 51st hull to be designed and built by Perini Navi. The sailing giants assembled in Porto Cervo will include Salute, whose 75m mast - the tallest aluminium mast in the world – was designed and engineered by Perini Navi's Mast Division in accordance with the latest trends in mast weight optimisation. Another star of the fleet will be the largest Perini Navi sailing yacht in the world, the 88m Maltese Falcon, winner of the last two editions of the Perini Navi Cup.